The truth lies in asian culture, where people are notably shy and outspoken. They have no other means of expressing their happiness, other than a smile, because everyone knows even an asian smile can be mistaken for their chinky eye lining. To show that they are indeed happy, asians outline their grinning chins with a “V” sign to draw attention away from their non-existant eyes. They also wouldn’t ever want to yell something while taking a picture because it would draw more attention to them. However, Asians are always stoked when a photo opp arises. In these situations, asians, instead of using America’s ludicrously awkward phrase, “Cheese,” will use the peace sign to show that they are indeed present in the photograph. By present, I mean enthusiastic and excited about being in someone else’s life story. This is due in part to the Asian love for emotional-understanding and inciting reactions (later post). That’s why Stuff Asian People Like’s Peter Nguyen went straight to the source this Saturday (China Town) to find out the truth about the Peace Sign. Though many refused to answer (or simply didn’t know how to), there were a myriad of explanations. 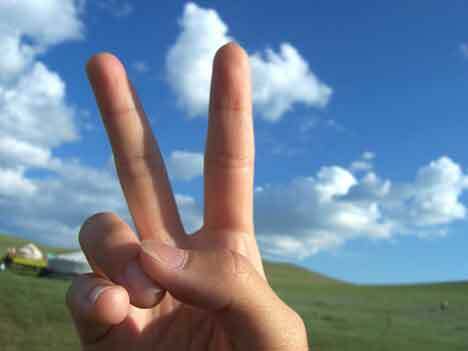 One such responder, who’s face lit up with joy when asked, was very accommodating and said that the peace sign was ubiquitous with “Being Number One, Victory,” or in Japan, “Ichiban!” She proceeded to demonstrate various positions in which the sign would mean different things. The funny thing is that she was making hamster noises in every which position to emphasize the importance of placement. 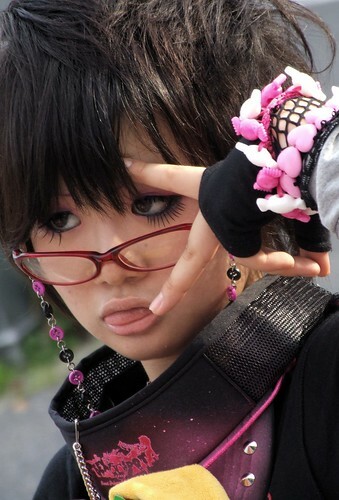 For example, a “V” sign in front of the face means that the asian is very egotistical and wants to draw the most attention possible to themselves. However, a lower-third peace sign around the abdomen region means that they are more reserved, and don’t want to overshadow others in the picture. Side-ways in front of the eyes is most definitely an older asian’s 80’s statement. The previous explanation was extremely thorough, but one little feline has most spurred on the globalization of the peace sign: Hello Kitty. Not just Hello Kitty, but all her Sanrio friends, anime/manga series, and commercial television have made the peace sign popular among school girls and in some cases, boys. (Batz Maru, Pochocco, and Pekkle are not female characters). Even though the fingers are non-existent in some cases, this pose has caused a revolution in which children think it’s necessary to raise peace signs to look cute and innocent. The sign lives on today as the residual of a more innocent time in which kids didn’t grow up with computers and instead drew pictures of their favorite cartoon characters.